Wisconsin Director of Athletics Barry Alvarez announced that for the fourth consecutive year, proceeds from the Badger football team’s annual spring game will be directed to a campus partner. And in 2014, dollars raised through ticket sales will help fund efforts across UW–Madison’s School of Education dedicated to improving student literacy. For 17 days in February, athletes and officials from around the globe will gather in Sochi, Russia, for the Winter Olympics. 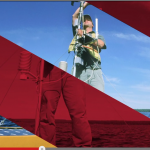 UW–Madison has experts on topics including large-scale athletic events, Russian history, the politics of sport, digital and social media use by Olympic viewers, and LGBT activism. Wisconsin Badgers Lauren Carlini (1), Courtney Thomas (3), Annemarie Hickey (4), Ellen Chapman (20), and Haleigh Nelson (13) celebrate their final point and 3-0 defeat of the UW-Milwaukee Panthers during the first round of the NCAA Volleyball Tournament at the Field House on Friday, Dec. 6. Badgers midfielder Brian Hail advances the ball during a first-round game of the NCAA men's soccer tournament against the University of Wisconsin-Milwaukee Panthers at the McClimon Memorial Track and Soccer Complex at the University of Wisconsin–Madison on Thursday, Nov. 21. At 6 a.m. on a home football Saturday, most tailgaters haven’t even finished marinating their meat — let alone shown up at Lot 60. Even though the Badger game won’t start for another eight and a half hours, Steve Pschorr is setting up his camping chair outside the Lot 76 ramp, waiting for the crowds to arrive. 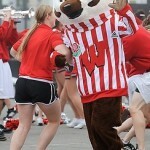 Wisconsin's newest invasive species is an imposter in Bucky's clothing. From a distance, recent visitors to Wisconsin's State Capitol might think they've caught a glimpse of the University of Wisconsin–Madison's beloved mascot, Bucky Badger. Examine the interloper with a Badgers fan's eye, however, and its puffy features, odd coloring and sloppy sweater make for a more disappointing sight: a knockoff, one that may have wandered far from its home range to America's Dairyland. Competition for airtime and brand recognition can be just as intense for institutions of higher education as it is for major national and international brands. The advertising space provided to each Big Ten school provides the kind of media placement that most universities could never afford on their own. Badger Connor Udelhoven (60) holds the ball for a young fan to kick at a field goal station during the Family Fun Day event at Camp Randall Stadium on Aug. 17. August in Wisconsin means one thing: the Wisconsin State Fair. 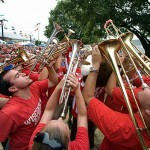 UW–Madison will again have a featured presence at the annual event on Wednesday, Aug. 7. The University of Wisconsin has named Learfield Levy Foodservice, a joint venture of Learfield Sports and Levy Restaurants, as its new restaurant partner for Camp Randall Stadium, the Kohl Center and other university athletic facilities. UW softball player Maggie Strange prepares to catch the ball during the first game of a double-header between UW–Madison Badgers and Michigan State Spartans at the Goodman Softball Complex on May 5. Three finalists have been selected in the search for a new director of recreational sports at the University of Wisconsin–Madison, Vice Chancellor for Finance and Administration Darrell Bazzell announced today. On Monday, Washington Wizards center Jason Collins became the first active professional athlete from one of the four major U.S. professional sports — baseball, basketball, football and hockey — to come out as gay. Wisconsin senior Ryan Evans has been named the 2013 Arthur Ashe Jr. Male Sports Scholar of the Year by Diverse: Issues In Higher Education. Inspired by tennis legend Arthur Ashe Jr.'s commitment to education as well as athletics, the Sports Scholars Awards honors students of color who have made academic and athletic achievement a winning combination. Almost three years ago, J.J. Watt turned to the Law & Entrepreneurship Clinic at the University of Wisconsin Law School for help setting up a nonprofit to fund after-school sports programs. Plan now to participate in one of the most anticipated springtime events to take place in downtown Madison. The 32nd annual Crazylegs Classic 8K run and 2-mile walk will be held Saturday, April 27, at 10 a.m. from the Capitol Square in Madison. Although Stanford didn't score many style points in the 99th Rose Bowl, the Cardinal could celebrate because they didn't let Wisconsin score any points at all after halftime. Wisconsin's 20-14 loss was the third straight in the New Year's Day game. As the Badger football team returns to the Rose Bowl for the third straight year, another Los Angeles-area organization is excited to welcome fans back for a day of community service. An interactive website will follow the historic return of the Badgers to the Rose Bowl and allow fans to share their Badger pride, wherever they are.